Lobster overboard! 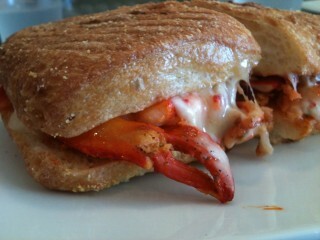 Take a bite of this gooey panini before the lobster sneaks away. A sweet new sandwich shop has popped up on Merivale Road, next door to The Merivale Fish Market that has been a fixture in this spot for almost 20 years. Luigi Panini is a great example of a “next generation” eatery, where the children of long-time Ottawa restaurateurs grow up and get into the business themselves. In this case, Anthony Epifano is the son and nephew of the family-owners behind the fish market. He and his pal Andrew Fisher (both Algonquin culinary program graduates) run the new lunch counter that doubles as an espresso bar and gelateria (serving a limited selection from Pure Gelato). The “Luigi” in the name is Epifano’s grandfather.